Western Design Center is the bearer of the 65xx series of CPUs, and the related peripheral chips. If you’ve ever used an Apple II, Nintendo Entertainment System, an Atari 8-bit, a Commodore 64, a Tamagotchi, or met Bender Bending Rodriguez or a T-800 Terminator, you’ve run into a 6502 or something that’s sufficiently similar that any differences are academic. The 65816, the follow-up chip to the 6502, can be found in the Super Nintendo and the Apple IIgs. This chip is odd; on startup, it is a 6502. Flip a bit in the register with two instructions and you have 16-bit registers, 24-bit address space, and a bunch of other goodies that you can’t fit into 3,500 transistors. The ‘816 is one of those chips that would have changed the world if it came out a few years earlier, but that’s a story for another time. If you want to build your own 6502-based single board computer, I would highly suggest you take a look at the 65816. The days of Nintendos and Commodores and Ataris running a 6502 are long gone, but the 65xx ISA is still out there. It’s found in everything from toys to life support equipment to aerospace, and if you want to play around with these devices, you’ll need to learn some 6502 assembly. Want proof? The greatest hack ever – [Sprite_tm]’s Matrix of Tamagotchis – is just a server emulating a few 6502 cores. These weird devices obviously aren’t using full DIP40s and the related support chips. Instead, they’re either using custom ASICs with licensed 65xx cores or one of WDC’s microcontroller offerings. The 65C134SXB (based on the ’02), and the W65C265SXB (based on the 65c816) are small chips at the intersection of a microcontroller and a system on a chip. This brings us to WDC’s latest offering, the W65C265WBX, or the Mensch microcomputer. The Mensch microcomputer is built around the 65C265, itself a microcontroller built around the 65816. This is a small board, with only the microcontroller, a few passives, eight LEDs, and a few headers. Effectively, this is a breakout board for WDC’s ‘816-based micro, with only the bare minimum required to get the thing going. What we’re really looking at here is a cut-down version of the ‘816 microcontroller development board I took a look at a while ago. Consider this a breakout board for the 65C265. On board, you have a full ‘816 core, a monitor ROM, a little bit of RAM, several serial ports, a bank of LEDs, and access to 16 address lines and 8 data lines. If you want to develop for the 6502 or 65816, that’s all you need. If you want more RAM, just grab some perfboard and wire it in. If you want to build a pocket-sized SID player, build a ‘shield’ for this tiny development platform. Compared to its full-size brethren, the Mensch is not as capable. 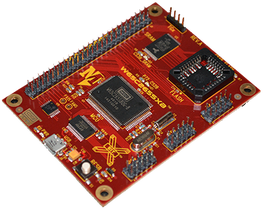 The W65C265SXB – the larger microcontroller development board based on the same chip – has 32kB of SRAM on a separate chip, a socket for a Flash chip, and a USB to serial converter on board. This is the cost-reduced version of WDC’s microcontroller offerings, though, and anyone who would want to build something with a 65xx core probably already has a USB to Serial converter sitting around. The monitor ROM is exactly what you would expect, granting access to the chip via a terminal emulator. Here, you can input machine code, jump to an address, and let LEDs blink to your heart’s content. You can use Python to talk to this board. If you’ve ever wanted to play around with 65xx chips, this is the board for you. When I reviewed WDC’s slightly more capable offerings, I lamented the cost of these single board computers and microcontroller development boards. Yes, they’re the best way to play around with the 6502. They are, arguably, the best way to learn assembly. This is a world of two dollar Arduinos, though, and it’s hard to compete on price especially with an American made and assembled board that doesn’t contain counterfeit chips. Still, I applaud WDC’s efforts to get their chips in the hands of more hackers. There’s still a lot of cool stuff you can do with a 6502, and if some of these young hackers end up going into industry they’ll probably come across the 6502 core at some point in their career. This is a CPU core that just isn’t going away, even though dying caps and corroded contacts means our Apple IIs and Commodores are. This is a great little board, and I can’t wait to see what kind of projects will be made with it. I wonder if it would be possible to make a pocket sized Apple IIgs using it? That breadboard placement defeats the purpose of a breadboard. Use two. Most of them have dovetails that interlock with each other. Alternatively you could run the wires underneath the board. This requires a little more care to get the connections correct but it worked for me (with a different board). It’s also the WDC founder’s last name – although when I first saw this title, I had assumed they were going for the “decent human being” connotation of the German word. Or Der Springer Der Rocketmensch! Mr Gordons, a shapeshifting NASA-created android with limited emotional capabilities. I wonder why I didn’t chime in much earlier… It also means the same thing in Yiddish. Being a mensch in Yiddish means simply that the recipient is a really nice example a of person. Now I won’t offer a definition for a different word however…..
Incidentally Brian if you join us for the Winter Demo Day NYC, I might be there with mine….. It wouldn’t be too much more than ^C ^V from a BASIC written for the 6502 and there are several of those. If you want to learn assembly, get an STM8 board. Much cheaper, and a much more capable processor with loads of peripherals, and useful amount of RAM. The CPU is simple enough that you can learn to program it in a weekend. That’s a bit like saying “if you want to learn Pascal then you should get a C compiler”. Assembler is not just one language, and depending on the processors in question it can be very different. Heck, even a 6502 vs a Z80 was a jump. I was responding to the line “They are, arguably, the best way to learn assembly”, which didn’t specify any particular CPU. And the STM8 looks as much as a 6502 as a 65816 does, and is more relevant in today’s world. That seems a bit of a stretch, considering the 65816 can operate in 6502 mode. To be more precise, the 65816 DEFAULTS to running in 6502 mode, you need to force it into 16 bit mode if you want the extra goodies. I was talking about the clunky 65816 native mode. FWIW, the 65816, in native mode, allows the accumulator to operate in 8- or 16-bit mode, and, independently of that, allows the index registers to operate in 8- or 16-bit mode. Also apart from that, it offers a ton of benefits over the ’02, even if you don’t latch, decode, or use the high address byte (A16-A23). It somewhat gracefully does things the ’02 does poorly or not at all. Clearly you’ve never programmed the 65816. It’s neither clunky or that far from a 6502. 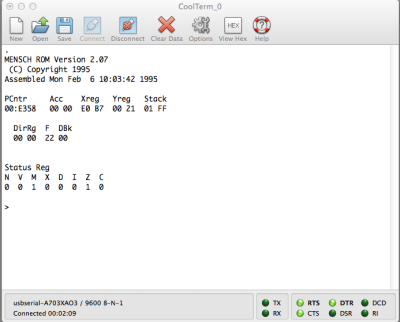 The ARM was designed to use the 6502 condition register and emulate 6502 quickly. In fact, the ARM designers looked at the WDC products first. I think it was the odd ball 65816 that convinced them they could do better themselves. 65C02 assembly is a reasonable introduction, then learn ARM. The old ARMs were a joy to write assembly for, but modern stuff is all Cortex Thumb-2, which is more complicated, and also unnecessary, since it’s so well suited to C.
Thumb-2 is there for a reason – to allow compilers or assembler to generate smaller code. The trade-off between RISC and CISC is that RISC code needs more memory space. Thumb-2 was designed to fix that while still running RISC code under the hood. Sure, Thumb-2 is great for performance. So is x86. But these aren’t really easy targets for someone interested in learning a bit of assembly programming. Thumb-2 isn’t compulsory, you can still write ARM v7/8 native binaries, you just need to tell the CPU which instruction set to use. The popular Cortex M series chips only support Thumb. Doesn’t Thumb exclude the fantastic conditional execution bit? Thumb-2 is more efficient overall. The instructions are less powerful, but they require less memory bandwidth, and you can fit more in the cache. Huh? Doesn’t the 6502 have essentially the same “condition register” as nearly every other CPU from that era? It doesn’t really matter what your first assembly language is – it’s more important that you use the machine to learn how to understand what’s inside a processor (or microcontroller), and how that translates to the “assembly language” that can be used to make it do useful things. If you succeed at that, you’ll have no trouble in the future picking up “more relevant” architectures. My first 2 architectures were the PDP-11 and the IBM 370 – the former took a lot of work to understand, the latter was a lot easier because when the professor started talking about “registers” and “data paths” and “microcode”, I already understood how those were important, and how they fit into a processor. I agree you can learn the principles on any platform, but if it doesn’t really matter, you might as well start with a $1 board with a better CPU (more features, faster, lower power, integrated debug, and better peripherals). I agree with you in principle, however 6502 knowledge can be pretty fun if you ever want to do some retro game coding. If nobody does it, then I will do it. The name is obvious to anyone who (claims) to know something about the 65.. history. After reading some books about Commodore that mention the company MOS I have a whole new appreciation about the way that computerchips were made in the early days. This was mostly handwork and/or craftmanship. Mr. Mensch was particularly good at it. Though I’m far to young to know the real details (other then mentioned in some books) I have to say “hat’s off” to those early day chip designers. So the board is named after Bill Mensch. Just like Bacon is named after Sir. Francis Bacon who was knighted for the discovery. to be honest… I’m not sure. But it seems more than logical to me. Because, if it looks, quacks and walks like a duck, then the animal we are talking about is almost certainly related to ducks. If you add bacon bits to bacon, it creates a powerful timeline distortion that allows you to go back in time and obtain even more bacon. Thank god it isn’t as bad as Googling Google! Mensch founded the WDC. So…. at $103.75 each, I agree wholeheartedly with that statement. Only thing is that I’d need to figure out how to add an external ROM to it. This is a wonderful chip for those who love the 6502 and it’s history like Atari, Apple II, Nintendo Entertainment System, Commodore PET. I can’t say the the price (with postage) is wonderful though. The chip itself is very interesting though. I never made the leap from Z80 assembly to 6502 so this might be an opportunity. The chip has 16MB addressing space so go for it lol. but that doesn’t rely matter if you are using external ROM/RAM. This chip could be used to hardware emulate many old computers or build something new with classic technology. They have other chips that look interesting as well. If you have a line of contact with the VP can you ask them when the hell theyre gonna fix the Silicon bug with the 65c51? The transmit buffer empty bit is stuck on in the latest batches meaning you have to use delay routines when sending data over the uart to prevent overwriting the outgoing byte before it’s even done sending. Can anyone confirm this for the 65C265/65816? Why would they do that ? Nobody’s going to buy that ancient stuff. Because they still manufacture them and apparently still tweak the designs considering they only broke it in the recent batches? They’re still making them so somebody is still buying them. Sure, a few people are still buying them, probably for use in old designs that they’re still selling. And the broken chips are apparently good enough for that. Fixing the problem would only be useful if they can attract new designs, but that’s a tiny market given that there are so much better options available. The chips don’t work in existing designs & require code changes exactly because of the stuck bit bug I mentioned. I suspect only hobbyists are buying the ’51. The ’02 however is still being made in quantities of over a hundred million units per year, going into ASICs, for controlling processes in automotive, industrial, appliance, toy, consumer-electronics, and even life-support applications. WDC makes most of their money from licensing the IP, not selling hardware. The fastest ones are running over 200MHz. and quite actually, we would not mind coming out with a mass produced ‘open source’ 65c02 or 65c816 based consumer computer platform, to the mechanical and emp quality standards of the cbm business machines. (also proper dip stuff, metal cases, etc, just nowadays with a bit more ram, an acceptable screen resolution, dvi-d output, ethernet, (although none of that usb trash), and fully solid state) (so not a c64 clone, but something new, everyone can just jump onto and either make clones of or develop software for, pretty much what apple had before they screwed up their entire market with that macintosh crap nobody ever asked for and didn’t know how to put to actual use other than make it show some predefined screens and move the mouse ;) the 6502 instruction set has the most people out there by far that know how to program for it, and thus, coming out with -new- computers that use it (without any need to ‘compete on price’ nowadays, it’s the only stuff that has proven to work 40 years or more anyway, everything else on the market gives up the ghost within 2 years so who cares about ‘competition’ ;) actually seems like a pretty solid business plan. (although there is 1 tiny competitor considering that the 80188 is also back in production for much the same reasons ;) arm? LOL. maybe the old ones, the new ones have a 1600 page datasheet you literally have to obtain from spies within samsung and then you still don’t know how to make it do things. useless. also mechanically weak. A little less mickeymouse than using delay routines is to use one of the timers in a 65(c)22 VIA in one-shot mode to generate an interrupt after the current byte has had time to make its way out of the ’51. Then the processor can be doing something else useful while the ’51 is sending a byte. BTW, the transmit buffer is just that, a buffer. The shift register is separate. You can feed the ’51 the first two bytes of a message with no delay between them, because one goes into the shift register immediately and the second one waits in the transmit buffer. Then you have to wait until the first one is out so the second one goes into the shift register and you can re-load the buffer. Thanks for the tips! I’ve been using a delay routine without much thought but an Interrupt is a much better idea cheers! The 65C02 is nothing like the 6502. It’s not just a NMOS-to-CMOS conversion. They actually took out a lot of “undocumented” instructions and added many new ones. The Apple II family moved to 65C02 and never looked back. They eventually went to 65C816 because if was more scalable to what they wanted to do. A lot of those microcontrollers you see in say, alarm clocks, are not-quite 6502’s, from what I understand. They used the 6502 family as a basis, because it is one of the smallest decently-performing designs you can get from the silicon. It has very few gates. Even the simplest ARM processor cores are a few times bigger than a typical 6502 variant! There’s a lot of truth there. I tried to summarize all the many differences between the NMOS version (6502) and the CMOS version (65C02), at http://wilsonminesco.com/NMOS-CMOSdif/ . It’s great to see the buzz around this board! For those who are interested in history and want to learn a little more about my uncle Bill “Billy” Mensch, here are a few links.